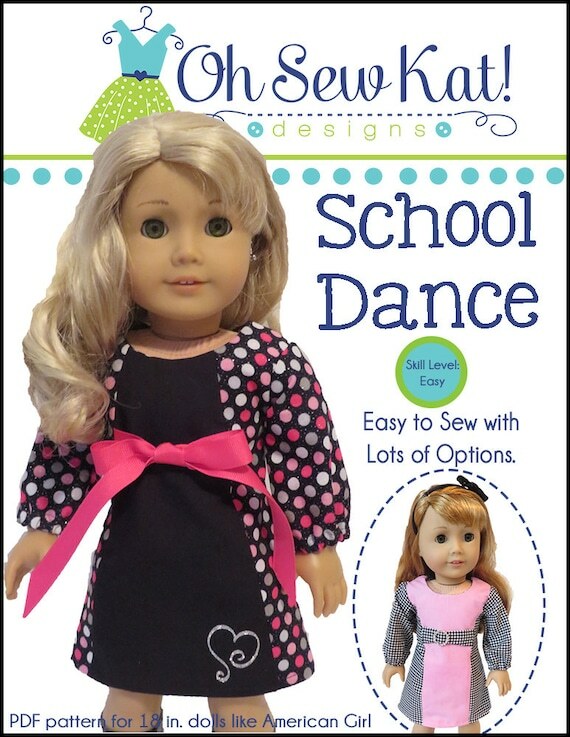 Gift Ideas – Oh Sew Kat! A few of my Favorite Things. Must have sewing notions and tools. A new year is here!! It’s time to clean up the sewing area and start brainstorming projects for 2019. 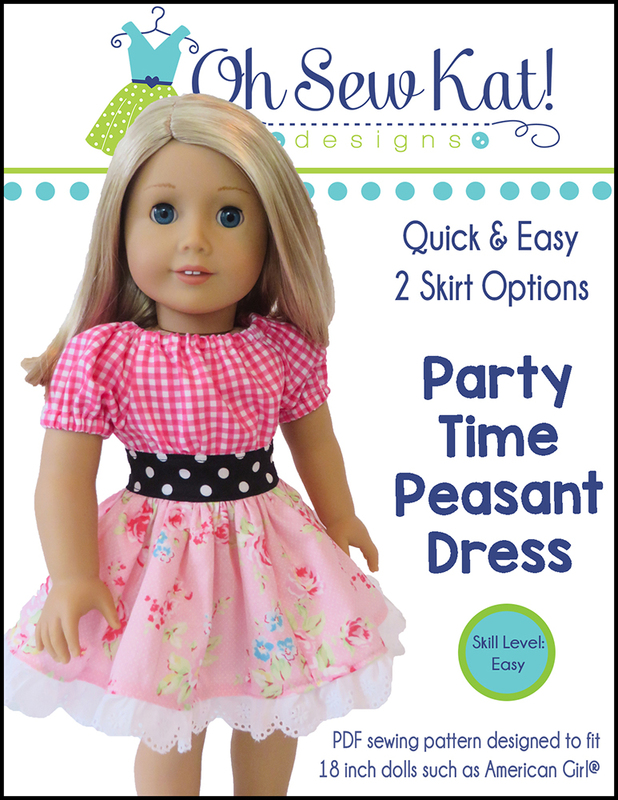 Before I dive into another fresh year of sewing, I like to share my annual 5 latest “must have” tools and notions for doll clothes sewing (or any sewing really!) These simple tools can make sewing smaller doll clothes a little easier and you can find all of them on Amazon. Click here to see my list from last year, and here to see my list from 2017. 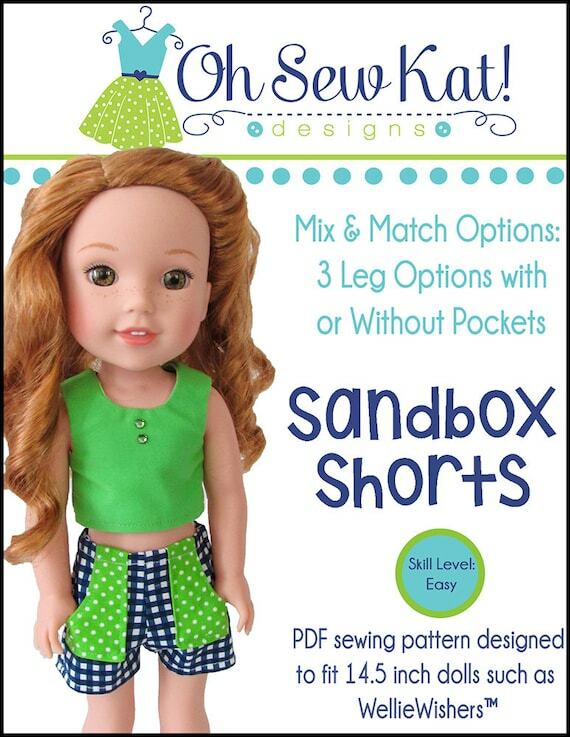 My annual list of best notions and tools for sewing doll clothes. This post contains affiliate links, which means that if you click on one of the product links, I’ll receive a small compensation. See my full disclosure policy HERE. 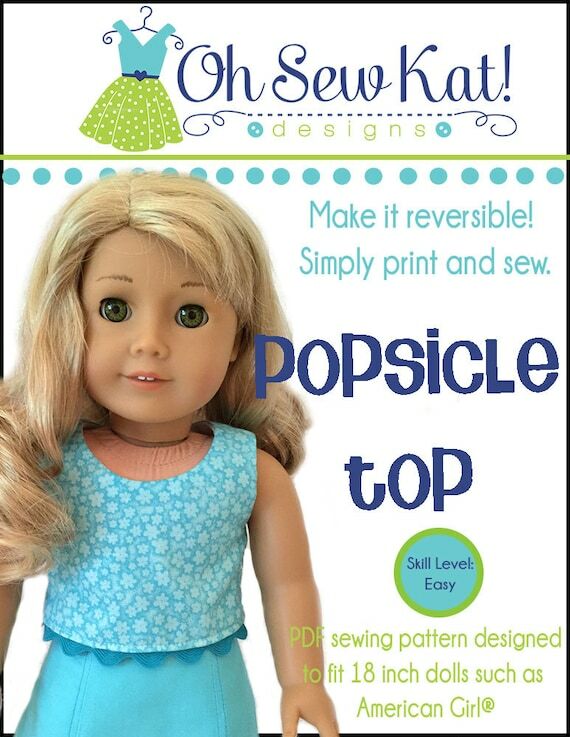 This brand new tool, made by Patty Young, is a game changer for doll clothes. I LOVE THIS TOOL. In a facebook group one day, Patty asked what tools we would like to see made that had her fabric designs on them. I suggested a gripping, foreceps type of tool and she not only picked my idea, she sent me one when it was actually produced about a year later! This handy tool is well worth the wait, and also the price tag (about $12). You will use it for all sorts of things- mostly to pull that slipped elastic back out of the casing, or to turn a tiny doll bodice right side out after you sew it together with just one little pull. This little tiny iron really packs some punch for the price. It gets super hot, has a steam option, and doesn’t turn off by itself (which is an advantage and disadvantage for sure!). I first used one at a sewing retreat a few years back. We plugged it in and left it on all week long. Lightweight and tiny, it got the job done and is a perfect companion to your doll clothes sewing tools. I think the difference from some others on the market is that it’s a travel iron not a craft iron. Everyone needs a pair of nice, sharp, high quality fabric scissors. You know the ones- the ones that you lock up yourself each night or threaten bodily harm to anyone found using them for anything other than fabric? I started using KAI scissors with my paper crafting. Strong and sharp, I found a pair that was a bit shorter and they are my go to for all of my fabric cutting. I own three pairs! I know I’ve mentioned this little gadget before, but yes, this year, my ruffler foot is on my top five list. 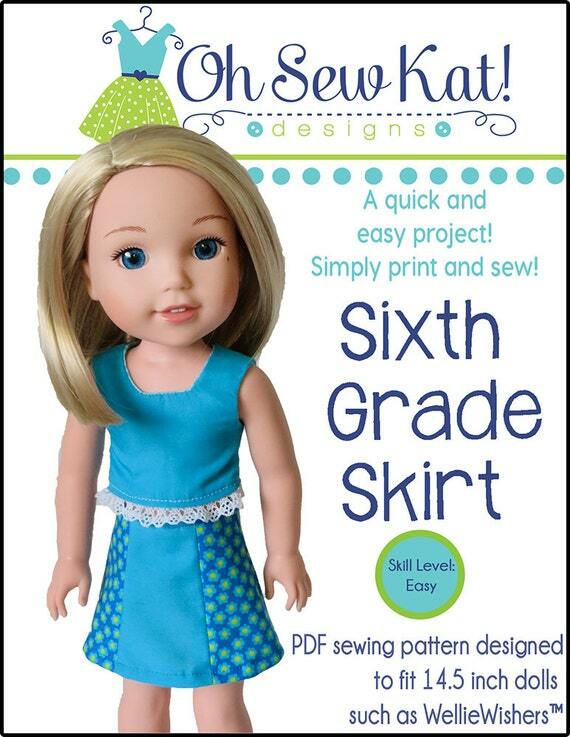 It’s just so quick to gather up a doll skirt (like 15 seconds quick!) that is really pays for itself over and over. I’ve kept a spreadsheet of some of my common skirt length settings (to make the skirt match up with the bodice for example) so I don’t have to figure it out each time. This foot is also great for the popular ruffled sleeves too, and makes putting a ruffle on a full skirt a breeze! Be sure to get the one that is correct for your specific sewing machine make and model. I believe I have an omnigrid ruler in every size they make- from 1 x6 all the way up to 24 x 24 inches. However, even with multiple rulers right at my finger tips, this 4×8 inch one is the perfect size for so many of my doll clothes needs. It’s easy to use to extend a pattern (make pants from shorts, or long sleeves from short sleeves for example) or for cutting straps, waistbands, and skirts with my rotary cutter. Keep this handy ruler right next to your work area. So there’s my Favorite Five for 2019. 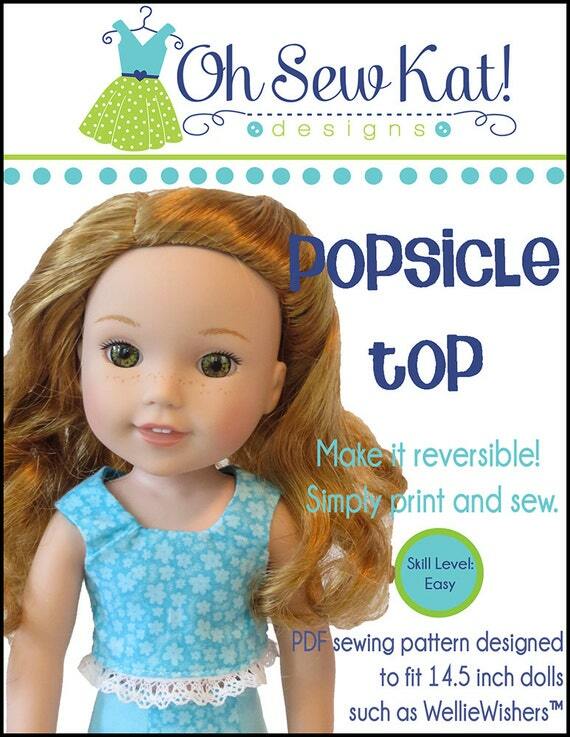 Use these few tools to make sewing your doll clothes a little easier and a little more fun. 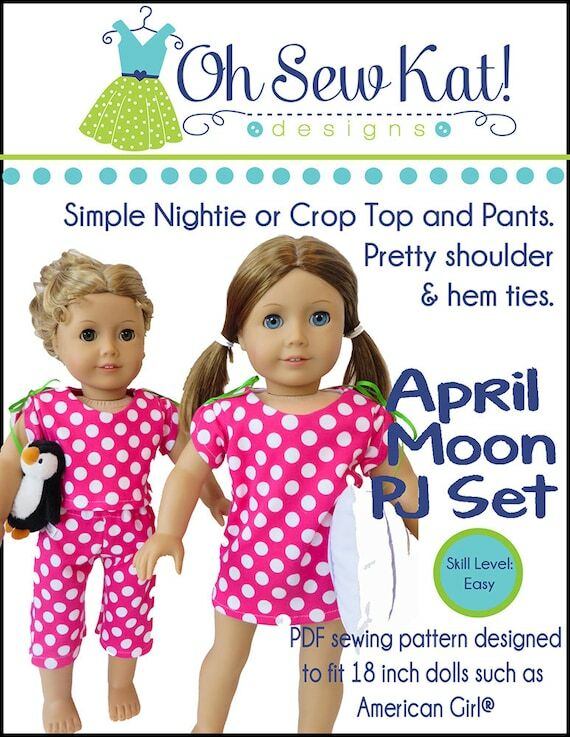 We’re going to have a great sewing year ahead, stop by again soon! 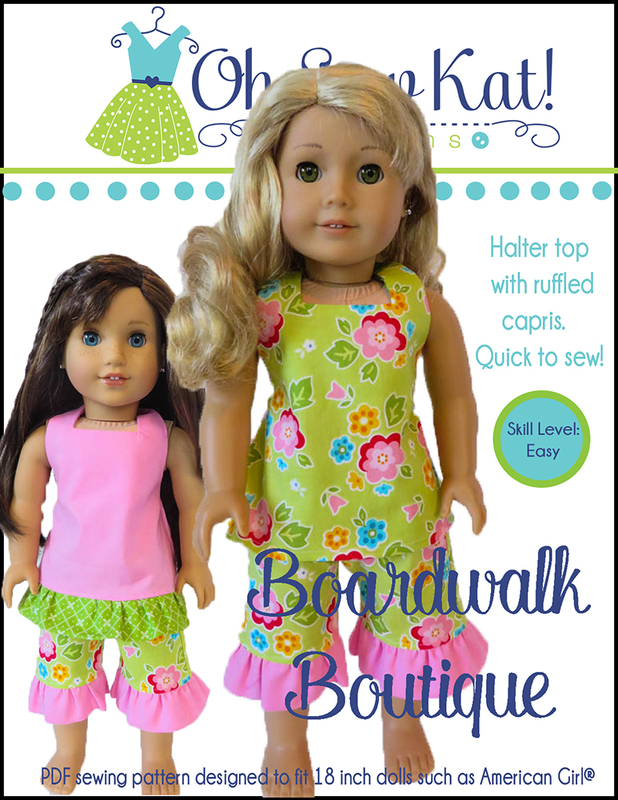 Are you looking for a simple sewing pattern to make doll clothes gifts this season? 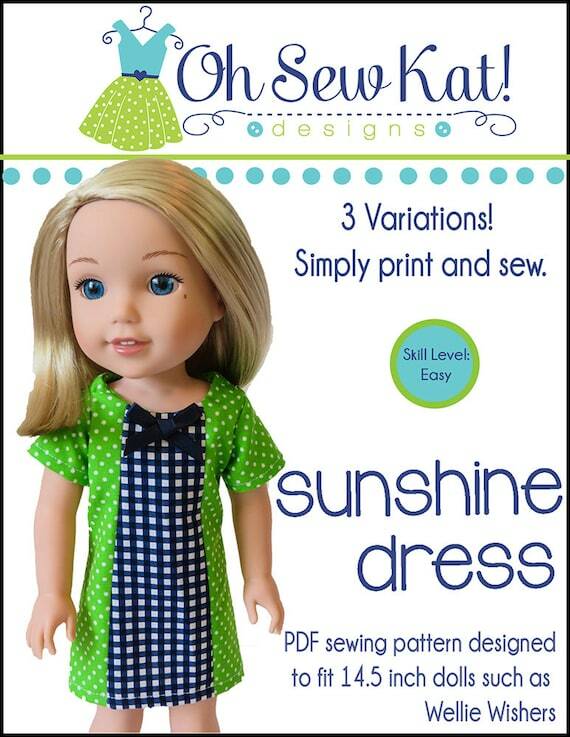 You’ll find a whole selection of easy level sewing patterns that you print at home from Oh Sew Kat! Take a look around the website, especially the Inspiration Gallery, and see all the fun ways you can make a simple pattern look completely special and unique! 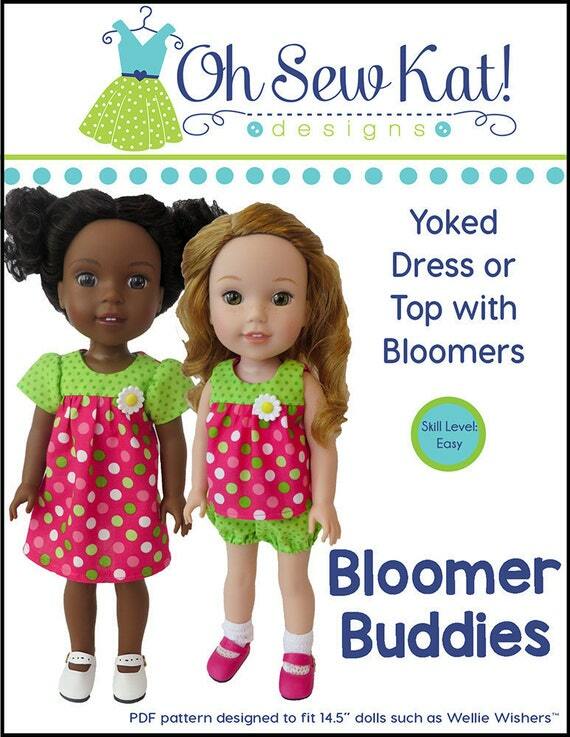 Try this easy version of the Bloomer Buddies pattern. 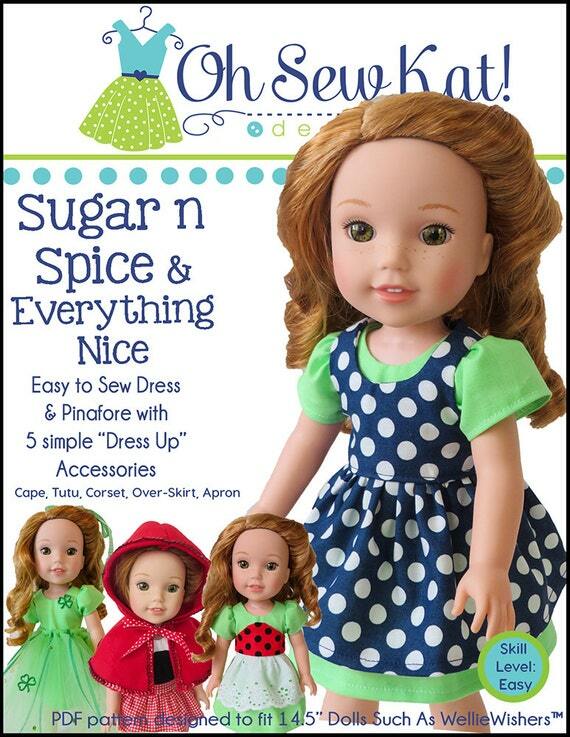 A classic green, Kona cotton, a red ruffle (I used pregathered eyelet), some red baby piping, and a holly felt cut out will give you the perfect classic Christmas dress for your 18 inch or other sized doll. She will be ready for her photo with Santa! I used my Big Shot Die Cutter and some felt to make the cute little holly accent for this dress. You could easily use your cricut machine or other e-cutter as well! I just love this classic look for the holidays! 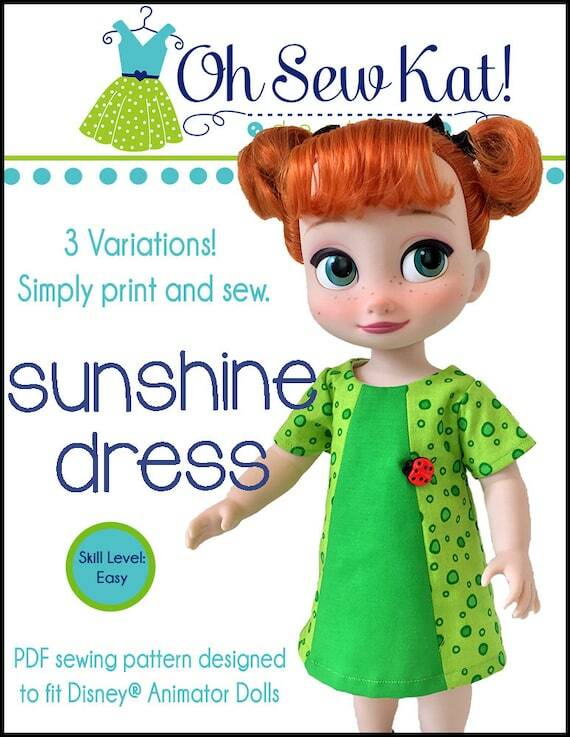 Make this dress for Disney Animators or 14 inch dolls like Wellie Wishers dolls too! 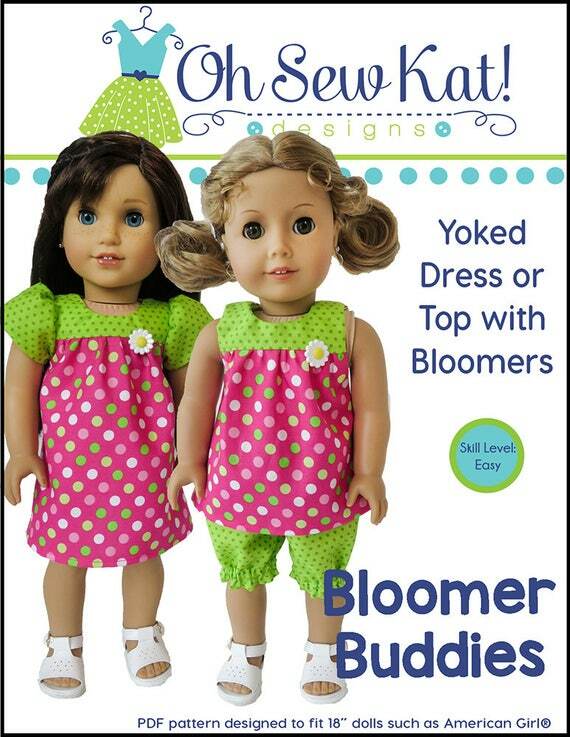 Find the Bloomer Buddies Pattern for 18 inch dolls (like American Girl, Our Generation, and more) here and see more ideas to make with it here and here. Wow! I was blown away when I clicked over to http://www.cricut.com to see their new fabric selections! Cricut may be my new favorite fabric store!! Take a look! This post contains affiliate links. I may receive a small compensation, at no cost to you, for products mentioned in this post. Thank you for your support! 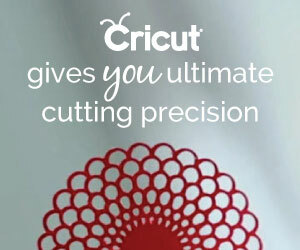 The cricut maker, their newest “power e-cutter machine” has a special rotary cutting blade that will cut your fabric for smaller projects. With a subscription to cricut access, you will have a whole library of patterns and designs that you can make with this new, powerful machine. I love my cricut maker. 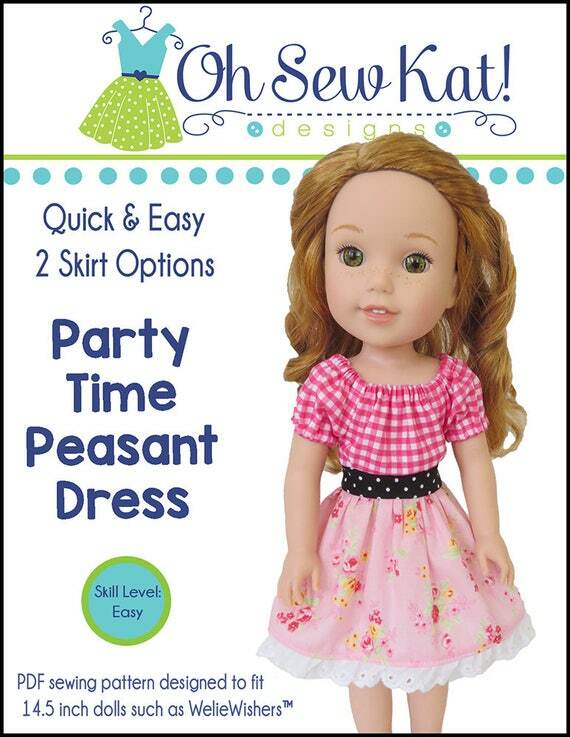 I use it all the time to cut out my doll clothes. You can find a basic tutorial how to that here. 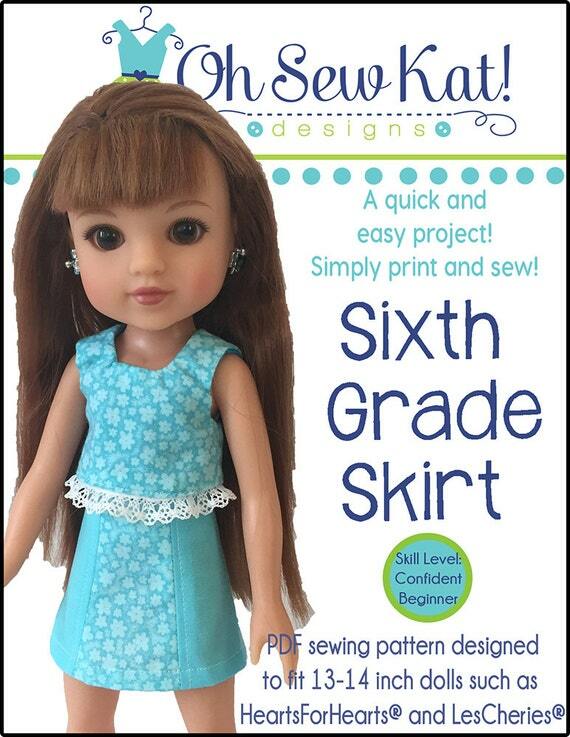 It’s hard to find good fabric with the right, small scale for doll clothes. Because cricut projects need to fit on a 12×24 mat to be cut out, they offer a large selection of beautiful, small scale fabrics. 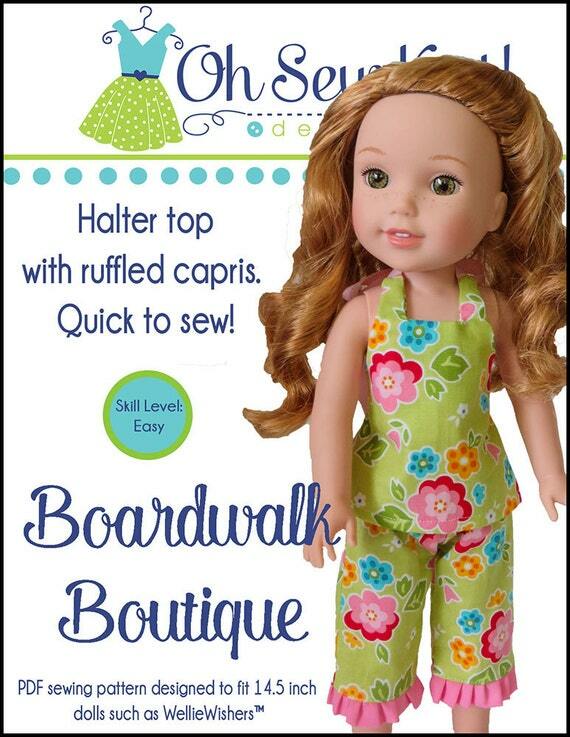 These gorgeous stripes, a collection by Riley Blake, could not be a more perfect scale for doll sized clothing. This is a great basic package to have on hand for many of your special projects. Here you can see the scale of the stripes with an 18 inch doll. I purchased the 10 inch squares (four of each color) and the fat quarter package (two of each color), but they offer strips and smaller, charm squares as well, as well as many other patterns. The quality is exactly what I expect from Riley Blake or any high end quilt shop. I think these red and green stripes would be a perfect ruffle on a holiday outfit, maybe a variation of the Boardwalk Boutique like these in this post! Be sure to sign up for cricut emails. They send out special offers quite often- in fact, I saved 30% on my fabric order! 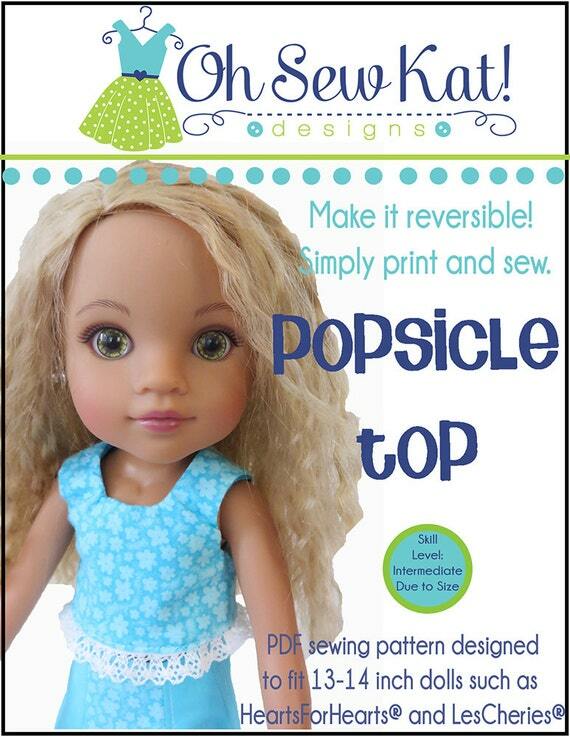 Visit my tutorial to see how to use a cricut machine for your doll clothes project.